Which Is the Best Way to Get a Wooden Garden Office? What Kind of Garden Office is Right For You? A garden office is a great way to create your own workspace in the inspiring background of your own garden, a way to make some room in your home if you had your workplace crammed in somewhere, or a good start for some self-employed work. The new global village is tightly connected and the need for daily commutes through heavy traffic to an office workplace becomes more and more obsolete. And who would not change that commute for a relaxed breakfast and a walk through the fresh air of your garden to your very own garden office? As you will discover, there are many options for such a creative workspace starting from rather small sheds with windows, enough for a chair, a table and maybe a sofa for the breaks available in the range from £1500.- to £3000.- to full-grown large garden offices suitable for companies with enough space for up to 10 workstations or for customer access, displays etc., verandas and even integrated storage sheds, spaces of 30 to 40 m² and still in many cases with price tags well below £7000.- to £8000.-. Which Kind of Garden Office is the Best for You? Small garden offices are right for you if you just need your own little safe, dry, warm and quiet space for concentrated work. You don’t receive business friends in your office, no customer traffic, you use the garden office just for your workstation to get away from the hectic and distracting everyday life in the main house with your partner, maybe children, ringing doorbells, ringing phones, and you like to create your very own space, suited to your style, functional for your job, with a relaxing and inspiring view of your green garden and the singing of the birds as the background music. We offer quite a range of models for you to choose from. Small rooms like these can be heated with little costs and a further thermal insulation can be applied easily. Just follow our guide how to insulate your garden office here. In this article, we list a number of options for suitable heatings. Electricity and a telephone cable, maybe WiFi will complete the infrastructure needed for you to connect with clients, customers, and business partners. 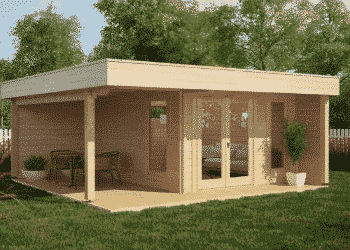 Here you will find a wide range of garden offices in a modern style. Many with flat roofs and double glazed floor to roof windows ensuring enough natural light inside. Our contemporary garden offices come in all sizes so the prices vary according to the space they provide. 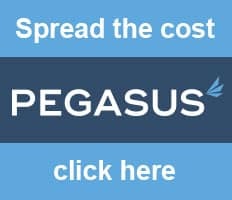 So prices are in the range of about £2500.- to £8000.- So even though the contemporary design being the connecting element in this group, there is one big advantage that could be of interest for you: Other than in the group of small garden offices, most in this group will have a wall thickness of 40mm or more. This will implicate two things that might prove useful: 1. The wall planks will have double tongue and groove connections which will make your walls tighter and better shielded against draft even after the shrinking, and 2. Insulation becomes much easier and more effective as the additional 1.5 – 2.0cm will have a profound effect on the R-value of the walls themselves. So you will be able to achieve a much more effective insulation with the same effort. Moreover, there will also be an effect of these thicker walls on sturdiness and longevity of your garden office, although small log cabins can be perfectly sturdy also with 28mm walls. So if you had a small office with just one work station for you in mind, you might choose a smaller garden office from our selection of contemporary garden offices to have the advantage of a bigger wall thickness. With a large garden office, you will have the options to provide the space for some employees, for customer traffic, for displays and exhibitions, space and a presentable background for business meetings etc. Also, mixed usages come into play here: Who says, that a large garden log cabin can only serve as a garden office? What about a comfortable garden lounge, a nice covered veranda to have al fresco lunch with friends on, enough space to have some dart or billiard or a large comfy sitting area, or a coffee bar in your garden office? All these usages that you would purchase a garden log cabin for are also possible in a mixed usage concept where a garden office is just one of them. For gardeners or anybody with a need for storage space, we also offer garden offices with a shed under the same roof. Spades, rakes, wheelbarrows, lawnmowers and other gardening tools don’t really fit that well into a garden office, where you might expect customers or business partners. So these sheds store these things out of view for visitors, and they are accessible from the outside so that you have a quick and easy access to your tools and materials when you work in the garden. The mud from your wellies will just stay outside, no need to put them off and walk through the office. After all these considerations you will be able to plan the right garden office for you and your specific way to use it.